Cost savings for attorney/witness travel; deposing attorney can be present in deposition, but associate/paralegal can view transcript and/or video from another room for a fixed, low cost. No software downloads only requirement is high-speed internet connection, web browser and Adobe Flash Player (which is usually installed on 99% of computers). 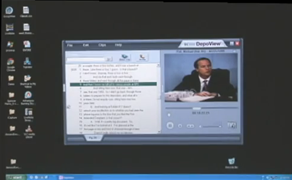 Video can be broadcast WITH NO DELAY through common web camera, or videographer's camera, if attorney chooses to videotape the proceeding. Audio broadcasting can simply be heard through built-in VoIP or via speakerphone (we can arrange toll-free teleconferencing as well). 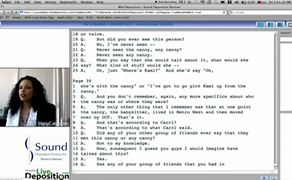 Transcription text is formatted from stenograph machine and is displayed in Realtime on your computer. Use Private Group Chats to get instant feedback from your associate, paralegal or co-counsel. Please note that we will be happy to do a demonstration of any of these methods upon your request. Learn What Live Streaming Can Do for You.